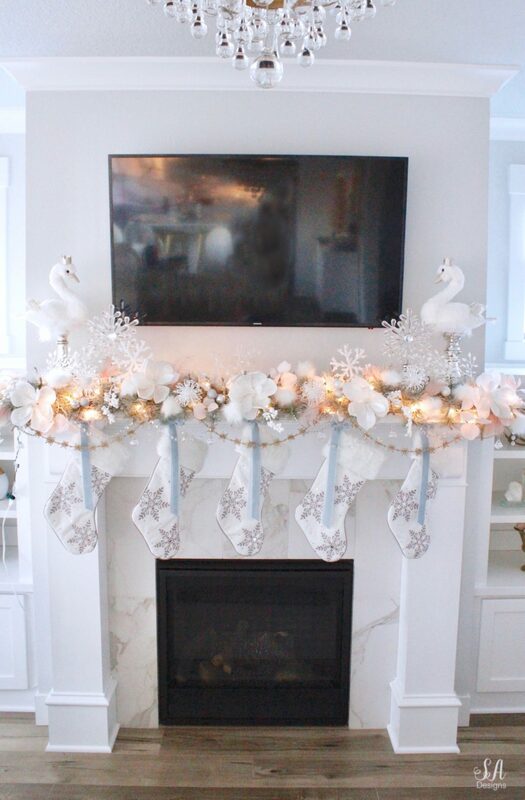 Today I’m joined by a group of my talented blogging friends who are also sharing their holiday mantel and vignettes ideas with you. 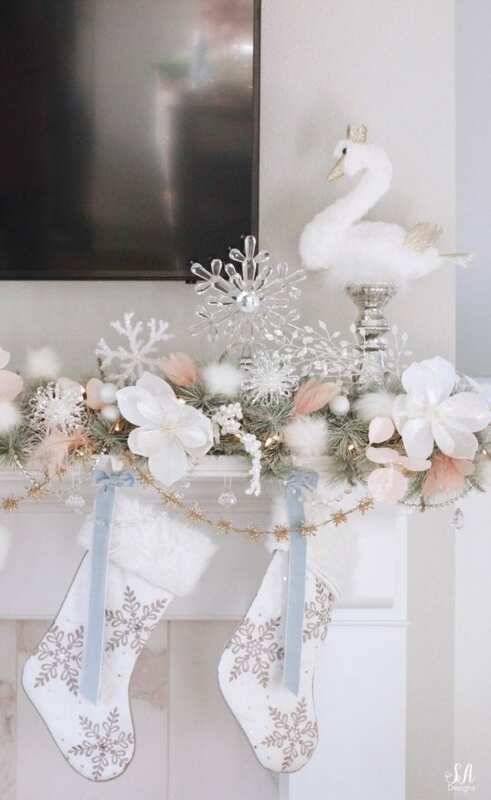 Yesterday I revealed my elegant flocked Christmas tree and entryway in mixed metals, but once you enter my living room, you’ll notice it switches and a couple of soft colors come into play. 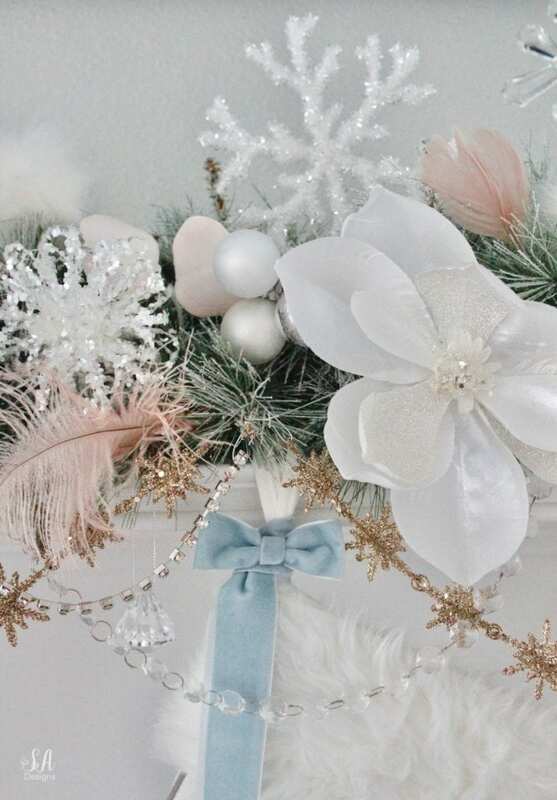 This whimsical glam Christmas mantel in pastels is different than anything I’ve done before and my family is loving it. I’ll tell you all about it! FIRST….two recent posts probably gave my regular readers a clue as to what my living room theme would be. 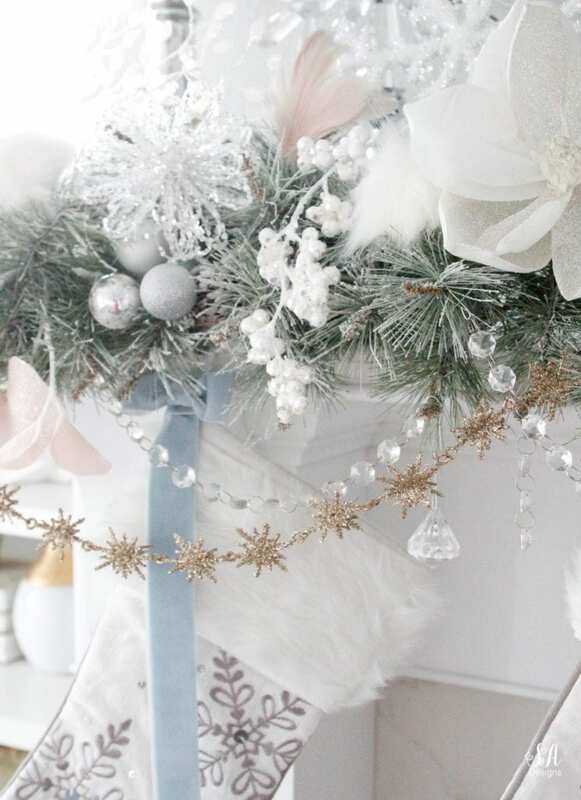 Last week I shared my diy ornament for the living room tree and it was a fun little sneak peek. 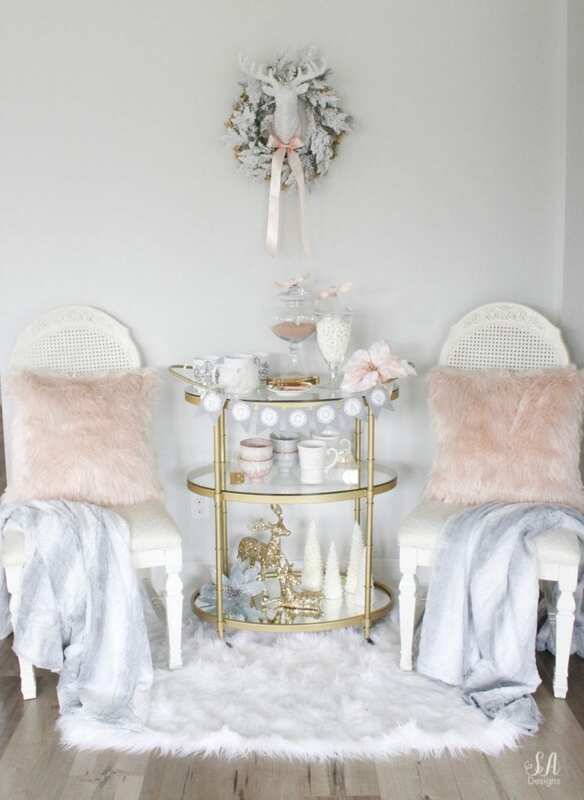 Then, I revealed our cozy glam hot cocoa bar cart here in the living room which also shared the same color palette and soft elements. Ok, so as I write this blog post, we still haven’t seen the new Nutcracker Movie. 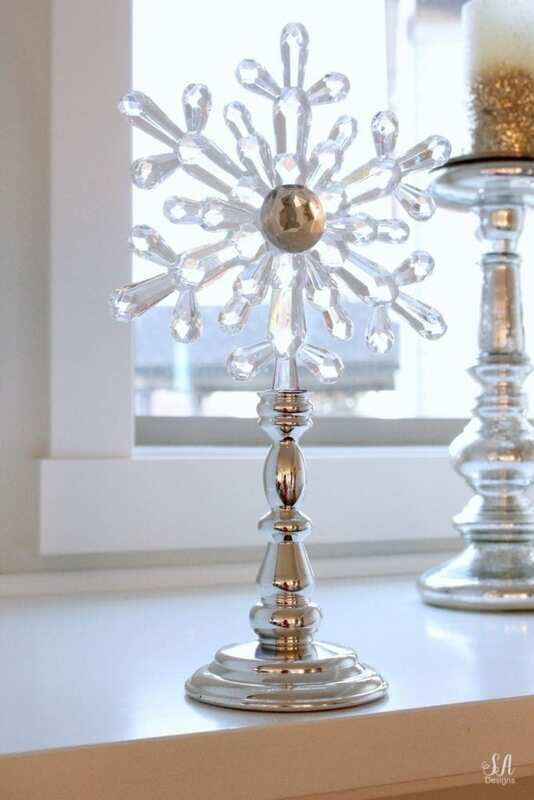 However, just seeing the previews over and over and reflecting on the Christmas tradition of going so many years at Christmas, I wanted to do something in my living room that brought that same kind of feeling. The fantasy, the dreamland, the playfulness and magic…I wanted to bring a little bit of that fun into my living room and kitchen. 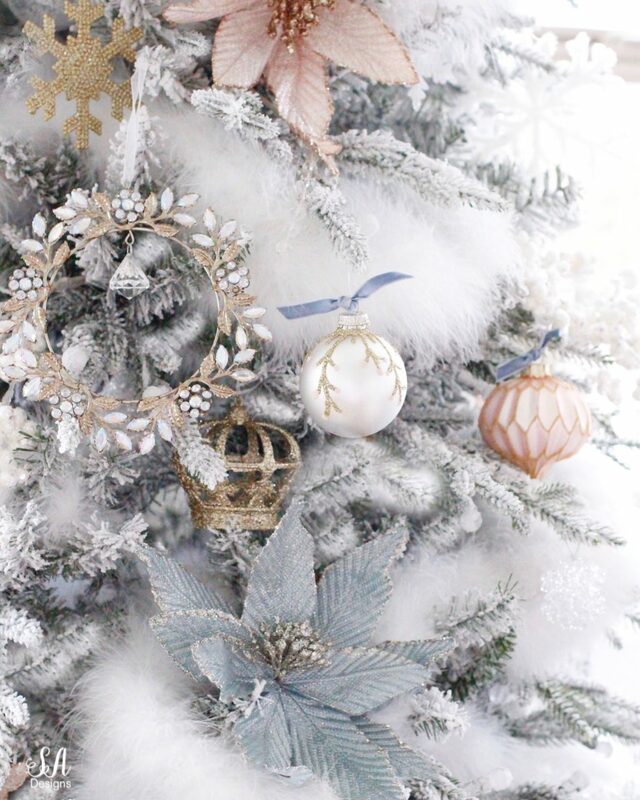 I’ll reveal the rest of my living room and tree, as well as my kitchen in the next couple of days! I found the prettiest crane (not shown but I’ll be revealing soon) with a gold glitter crown at a local boutique last week and it gave me an idea. 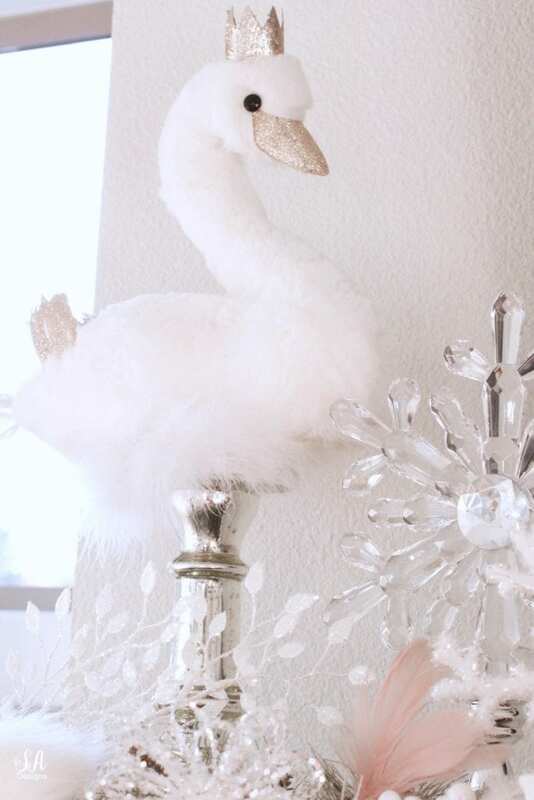 I wanted two swans on either end of my mantel, sitting on mercury glass candlesticks. Swans are so pretty and regal, elegant and graceful. 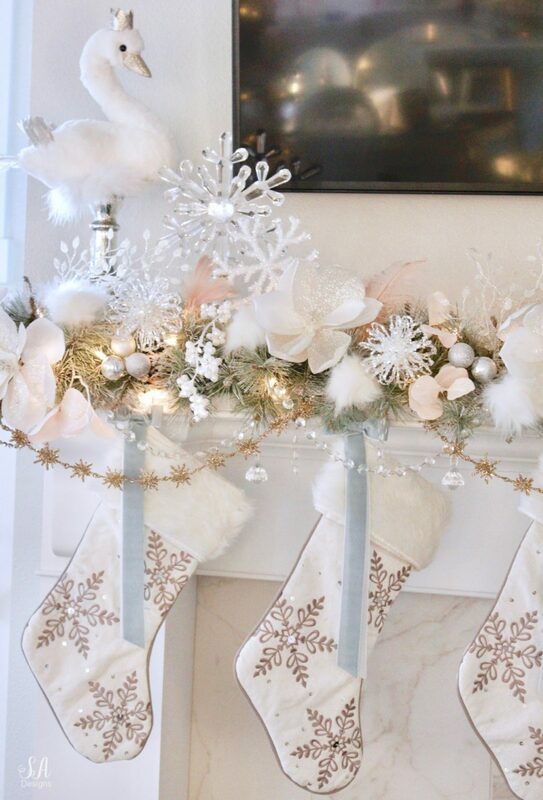 They were the perfect way to start this mantel. 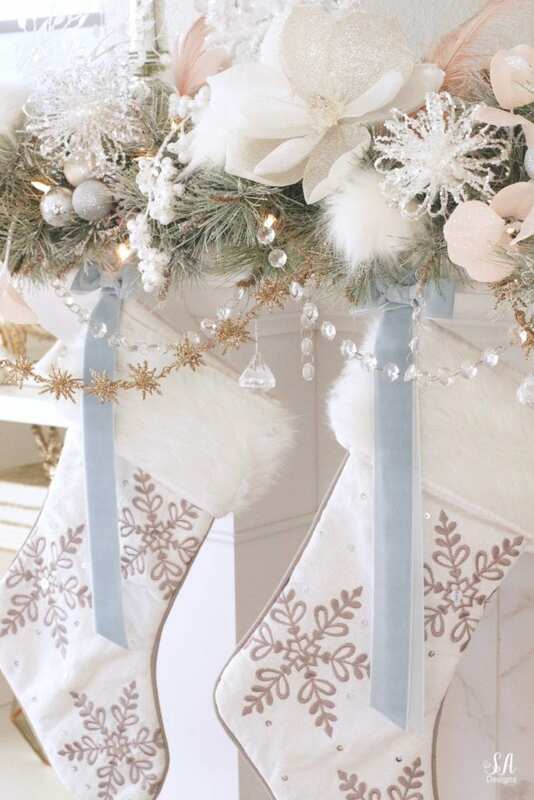 I added my 3M hooks along the front of my mantel for my stockings and separate ones for my garland. After a few hours of letting them set and adhere, I added my garland and stocking to the correct hooks. 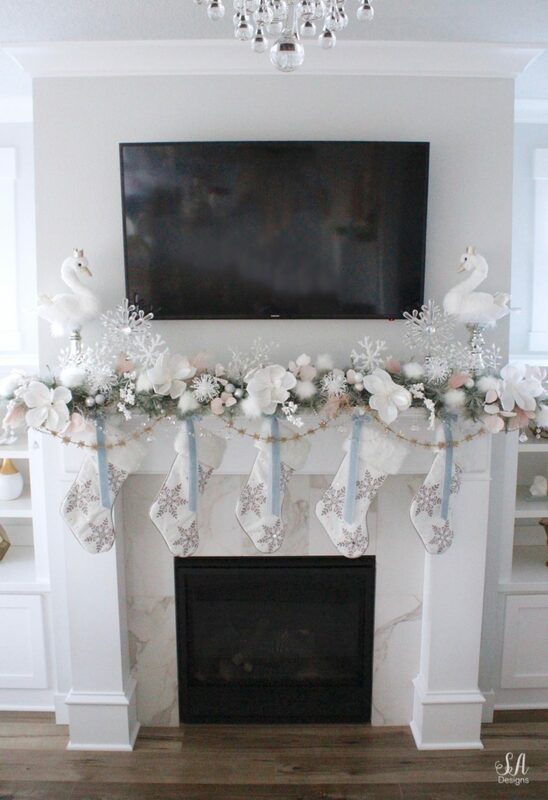 These fun snowflake stands (found them a couple years ago at Hobby Lobby) seemed like the perfect thing to place on the inside of the swans on my mantel. 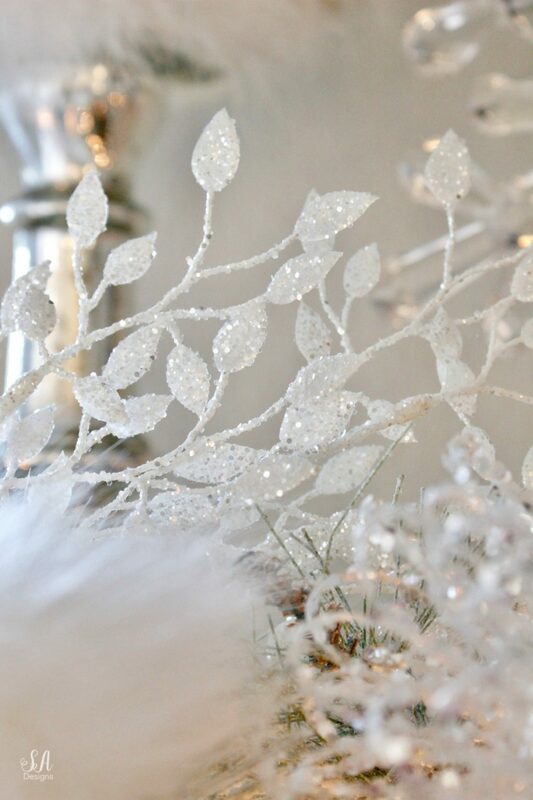 Then I started placing all my pretty glittered Christmas magnolia stems, white glitter berry stems, faux fur pom poms, blush Christmas floral stems, blush feathers, sparkly white Christmas stems, sparkly snowflake picks, and other sparkly ornaments. 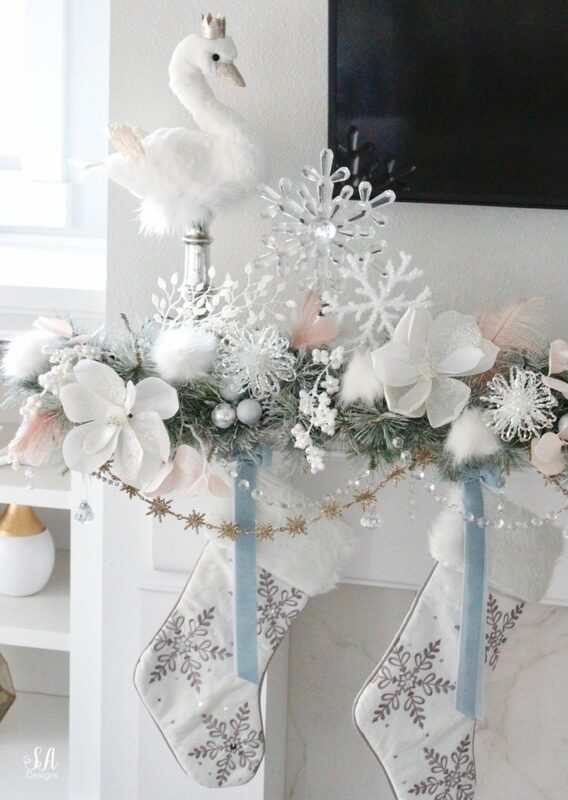 We’ve had the snowflake stockings for a few years but 2 years ago I added faux fur to the cuff and loved it. This year I added cute dusty blue velvet bows and ribbon to each stocking to tie in the dusty blue. I love it. It’s removable and just a fun accessory. Then for the fun part! 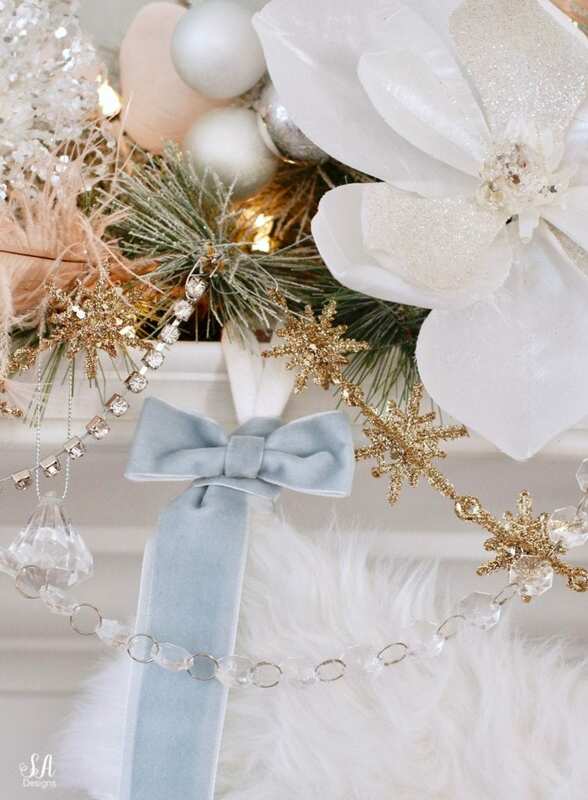 I also found this pretty gold glitter star garland at a local boutique and hung it from my faux pine garland. 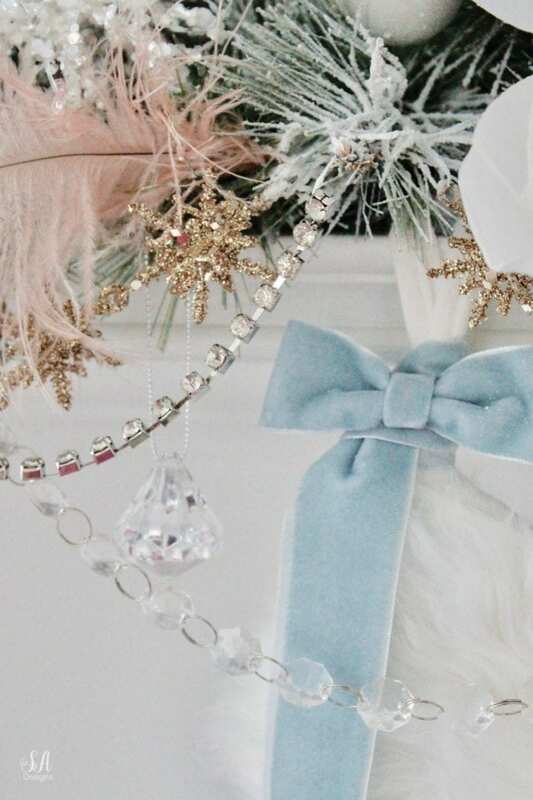 I went into my craft room and grabbed old chandelier prism strands and also a couple yards of rhinestone trim and hung them, overlapping the other garlands, across the bottom of the front as well. Then, I attached them with small ornament hooks. There were a handful of acrylic gem ornaments left over from other trees so I hung them in between the garlands to dangle. This is how it looks with the lights off. And with the lights on! Fun, right?! The kids are in love! Once you see it with the rest of the room and kitchen and dining area, you’ll see how it all comes together. It’s like a little bit of magic in our home! 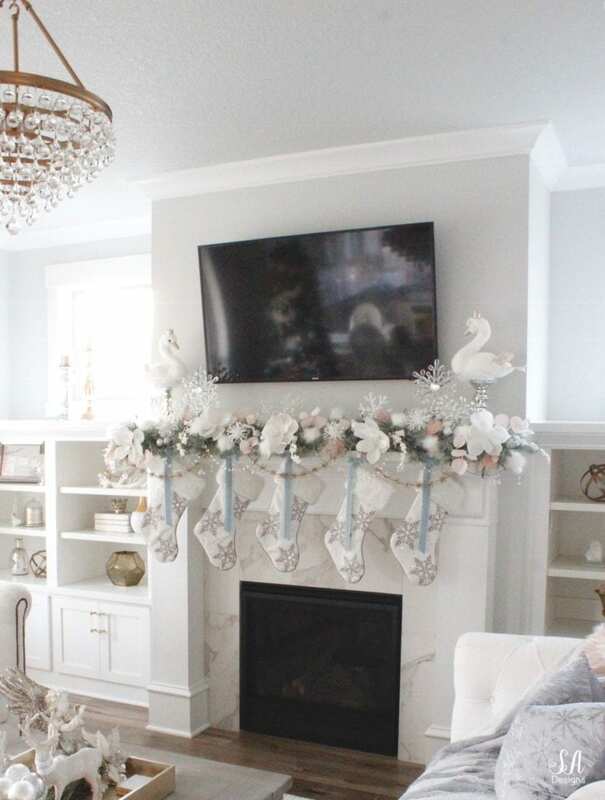 Please hop on over to my other friends and visit their mantels and vignettes below! Aaah those colors together, I looove the soft pinks and blues! So pretty, Summer! Love all the soft colors together. This is so tender and sweet. Beautiful. So beautiful and feminine! Thank you for joining in the blog hop Summer. So gorgeous, Summer! I love the soft tones, it’s so dreamy and cozy. 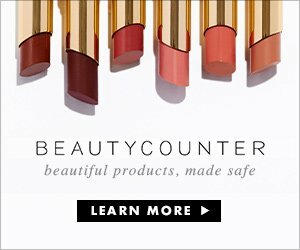 I absolutely love your gorgeous color scheme, Summer! 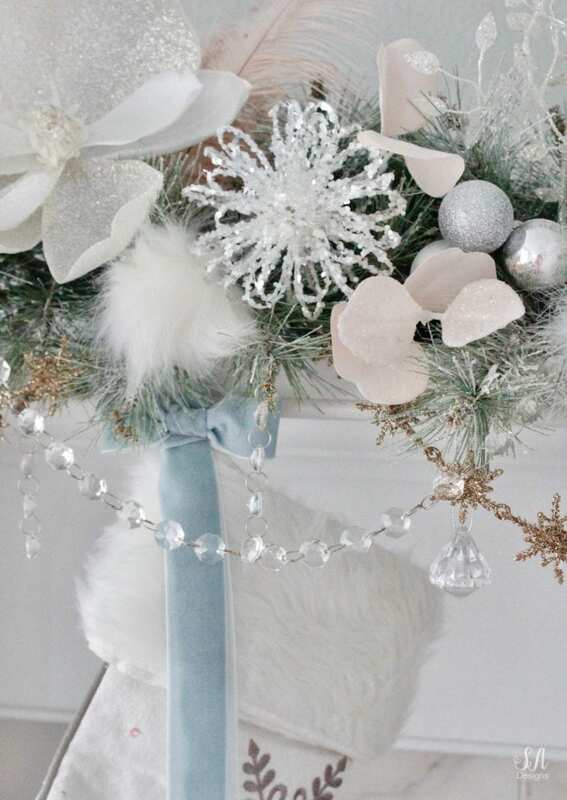 Such a lovely mantel! Hope you’re having a wonderful week!